The current situation of our culture and world is far removed from the idyllic picture of peace the prophet Isaiah foretold of in the verses covering the latter part of this lesson. Just turning on the news in the morning spouts stories of evil, hatred, gossip, destruction, and lives torn apart due to the ravages of sin in this world. Have you ever wondered what life would be like if it were different? What if we lived in a time when peace prevailed and our relationship with God was uninterrupted by sin? There once was a time like that. It was during the period of innocence with Adam and Eve in the Garden of Eden. As we are continually dealing with the evils around us today, you too may have wondered for a time when the world knew nothing but the peace of God. The good news is we have a renewal and restoration of such a time coming in our future. For the people of God, one day we will be introduced to a world devoid of the hatred and sin we have become so accustomed to when our Savior, the prophesied Branch, comes back and takes His reign. In the chapter before today’s text, where people are hearing such words as “Oh Assyrian, the rod of mine anger, and the staff in their hand is mine indignation,” Isaiah 10:5, there needed to be a measure of hope for the people to look forward to. When God’s warnings go unheeded, He does what He must do to direct the hearts of sinful people back to Him. God then sends them a promise of a remnant (Isaiah 10:20-23) and tells them, “Be not afraid of the Assyrian: he shall smite thee with a rod, and shall lift up his staff against thee . . .” (Isaiah 10:24). It was going to get rough for the people and they would suffer punishment, but the promise was still up ahead for something so much more wonderful. Have no fear, for those same instruments He uses, He will judge due to their own pride (see Isaiah 10:15-16; 33-34). “He shall cut down the thickets of the forest with iron, and Lebanon shall fall by a mighty one,” (Isaiah 10:34). But, for God’s people there is the promise of new growth that will arise and be a beacon of hope, ushering in peace unimaginable. Isaiah then paints a beautiful picture for them and us to hold onto in chapter 11 (today’s text). This world and all its trappings, fighting, and sin will not have the final say. What’s up ahead is so much more glorious. Just wait for the return of the Branch at His reign. Isaiah, the first of the Major Prophets and the author of this book, is known and called by many today as “the eagle eye prophet” for his ability to foresee the birth of Christ some 700 years before it occurred. Though much of his ministry was filled with rebuke and warnings to God’s people over their wicked ways, he was also able to encourage them through what the Lord allowed him to see in their future. Some of the visions he saw went even beyond the birth of Christ into His future reign at His second coming. This is magnificent when you think about it. This prophet was allowed to see the first and second coming of our Savior King. And, what he saw in correlation to the second coming was mind-blowing. For those who are tired of the troubles of this world, there is a greater story up ahead and it starts with a glimpse of the past. 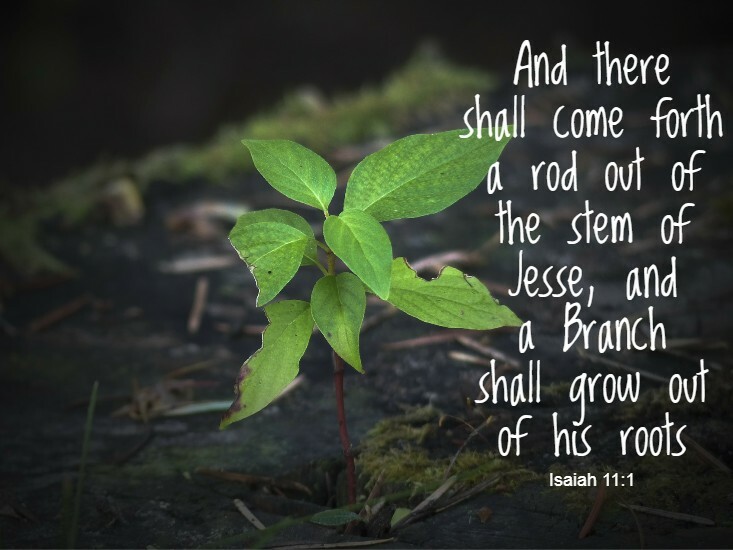 “And there shall come forth a rod out of the stem of Jesse, and a Branch shall grow out of his roots.” This verse and those following we identify as the Messiah, the Lord Jesus Christ. As many Bible students are aware, Jesse is the father of King David. Why is that significant? The fact is God gave David a promise through the prophet Nathan saying, “Thine house and thy kingdom shall be established for ever before thee: thy throne shall be established for ever,” (2 Samuel 7:16). Although David and his descendants died and passed off the scene and saw corruption, there would still be a sprout that will grow from the roots of this family to secure that seat on that throne that shall be established forever. There will be one who springs up from this royal lineage that will not see corruption, but rather reign forever (Acts 13:37). And, His name is Jesus. Of Him it was spoken of, “He shall be great, and shall be called the Son of the Highest: and the Lord God shall give unto him the throne of his father David: And he shall reign over the house of Jacob for ever; and of his kingdom there shall be no end,” (Luke 1:32-33). From before the beginning to the end of His life Jesus was fulfilling the promise of this forever kingdom rule. He is that prophesied rod and Branch Isaiah foretells of. If you have ever cut back some plants and placed them in water and tend to them, they begin to grow roots and sprout new life to them. A new and better life has always been God’s desire for His people which is why it was so important that they learn about this promised Branch and cleave to the hope of peace found in Him. Prophesying of this Branch was not only something Isaiah foretold of but Jeremiah as well. Jeremiah 23:5, supporting the imagery found in Isaiah, also prophesies of Christ as the Branch from David: “Behold, the days come, saith the LORD, that I will raise unto David a righteous Branch, and a King shall reign and prosper, and shall execute judgment and justice in the earth,” (see also Isaiah 4:2; Jeremiah 33:17). One more note on our Branch description of Jesus to solidify He is the fulfiller of these prophesies. After His birth, His parents had to flee Bethlehem for fear of Him being killed by Herod. This landed them in Egypt. When it was time for Him to be safely returned to the area, God spoke to Joseph in a dream instructing him on what to do next. In Matthew 2:23 these directions led them to Nazareth. This was very important because as it reads: “And he came and dwelt in a city called Nazareth: that it might be fulfilled which was spoken by the prophets, He shall be called a Nazarene.” That word “Nazarene” is “nezer” or “netzer” in Hebrew which means “branch.” The Bible could not be any clearer on who this true Branch is: Jesus Christ. PLEASE NOTE: Jesus did not “get” the Spirit at the time of His baptism. Jesus has always been fully God, meaning, fully endowed with the Spirit, and fully man at the same time. These functions allow Him to be the ultimate righteous judge we see figured in the next few verses. PLEASE NOTE: When Jesus began His earthly ministry, He quoted from Isaiah 61:1-2 which begins with the words, “The Spirit of the Lord God is upon me…”, and declared the same prophecy spoken therein was speaking of Him (see Luke 4:17-19). The term “quick understanding in the fear of the LORD” simply means He justly and obediently operates and follow’s His life course to please the heavenly Father. His life is as an aromatic offering of Himself. “He shall not judge after the sight of his eyes, neither reprove after the hearing of his ears.” One of the strongest things that condemn or acquit a person in our judicial system is evidence; the stuff that people see and hear that prove a case or not. We rely on this in order to have fair and unbiased proceedings. But, what if a situation comes where the evidence is just circumstantial and can’t really be trusted to condemn or not? He, of whom this prophecy speaks of, will base His judgment on nothing other than “righteousness” which is the truest measure wherewith anything can be measured by. He will make sure those that are considered the least of all; those who are usually not able to defend themselves – He will make sure they will have a just, fair, and right outcome. His righteousness is mandated by His holiness. His holiness and just judgment are directed by the power of the Spirit in and of Him which includes all those special areas as noted above: wisdom, understanding, counsel, might knowledge, and of the fear of the Lord. He is completely empowered to discern, advise, and carry out His sovereign righteous reign. “He shall smite the earth with the rod of his mouth, and with the breath of lips shall he slay the wicked.” 2 Thessalonians 2:8 tells us, “And then shall that Wicked be revealed, whom the Lord shall consume with the spirit of his mouth, and shall destroy with the brightness of his coming.” No adversary, not even Satan himself, will be able to stand when the reigning Christ opens His mouth in judgment. The Centurion, when Jesus was coming to his house to heal his servant, sent and said unto Him, “Lord, trouble not thyself: for I am not worthy that thou shouldest enter under my roof: Wherefore neither thought I myself worthy to come unto thee: but say in a word, and my servant shall be healed,” (Luke 7:6-7; emphasis mine). In that coming day, when Jesus cracks the sky and returns, He will but speak a word “and with the breath of lips shall he slay the wicked” (compare His powerful words to Hebrews 4:12). He will totally crush and destroy evil with the truth and right judgment that comes from His mouth. He that it is spoken of that came to “steal, kill, and destroy” (John 10:10) will ultimately face the same demise he tried to afflict on humanity. “And righteousness shall be the girdle of his loins, and faithfulness the girdle of his reins.” As a belt that holds up a garment, He that is coming will be wrapped in “righteousness and faithfulness.” What that means is all that He is, and all that He has, and all that He does is guarded and supported by some of the most precious qualities about Him: His righteousness which simply is to do that which is completely and perfectly right, just, and with the utmost integrity; and, His faithfulness which personifies His sure character of never failing and steadfastness. Out of all the leaders throughout our history here on this earth and out of all the leaders we currently see in power or vying for position now, He is the only One empowered completely to reign right. In other passages of Scripture we see, “The LORD reigneth, he is clothed with majesty; the LORD is clothed with strength, wherewith he hath girded himself . . .” (Psalm 93:1), and “For he put on righteousness as a breastplate, and an helmet of salvation upon his head; and he put on the garments of vengeance for clothing, and was clad with zeal as a cloak,” (Isaiah 59:17). Our King is already now and will be then, dressed and ready to render proper justice in this world and no evil will be able to stand against His judgment. Peace as we have never known before. An age that resembles the innocence of living in the garden with God once again as He originally designed. There’s a beauty here that can’t be missed. A place now where only our imagination can take us until that promise of hope is finally fulfilled in that day. 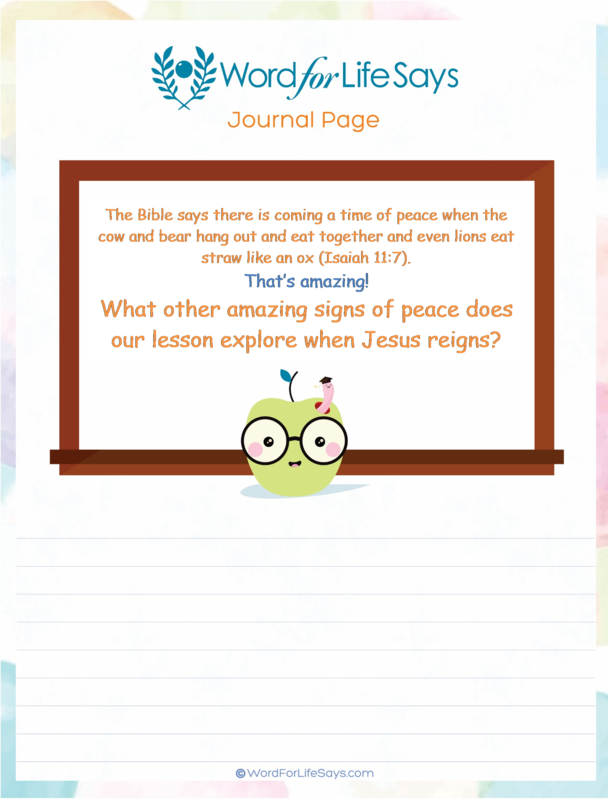 Once I wrote an article titled Interruption of Peace, expressing in it how the enemy comes to steal peace that God gives, yet peace is His divine promise and blessing to us. 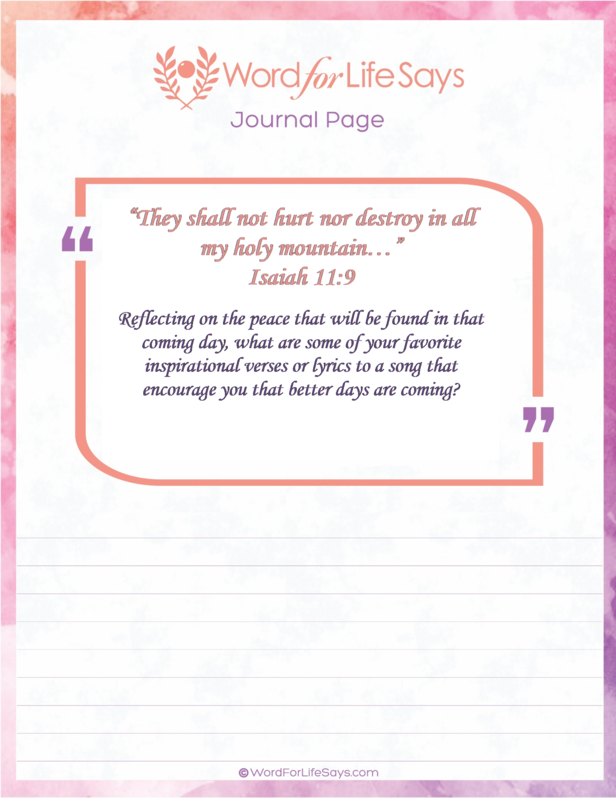 In it I talk about how peace is something that must be fought for; it’s about what we let dominate our lives (read article www.wordforlifesays.com). But, here’s the blessed thing of that coming future day – we don’t have to fight for this peace. We don’t have to struggle with the day to day issues of life to lay hold of it. It is there. It is our promise. It is our hope. It is what He has already secured for us and at His reign, we will know it like we have never known it before. PLEASE NOTE: We I speak of “at His reign” I am speaking of the future day of fulfillment when Jesus returns a second time to rule forevermore. Of course, as saints of God, we know that He is ruling even as we speak now. We are not diminishing that; rather we are magnifying the extraordinary event that will take place in that day when the Branch comes and solidifies His reign of peace. Oh, what a day that will be! In that day, God’s creation will operate under a spirit of divine fellowship with one another as He originally created them to be. There is no top of the food chain or bottom of the food chain status to worry about. His peace; His righteousness will be felt by every being in nature and none shall be absent from the knowledge, the simple knowing, of who He is. Even as fantastic as some childhood movies and books depict humans and animals living together in harmony, side by side, without fear of attack or being eaten [I happen to love those kinds of stories by the way], in most of those stories there are still elements that can cause fear, distrust, and anguish between the two. In that coming day, none of that will exist. Only the companionship of simply being will matter. After all, who ever heard of “cows and bears” getting along or a “lion” that eats “straw like the ox?” Who would ever in this day of ours allow babes and toddlers (sucking child and weaned child) to play with snakes (asp and the cockatrice)? His coming kingdom, at His perfect reign, the things which by nature seem impossible and unheard of now, will be possible then. The only characteristic there is summed up in one word: PEACE. All sin and evil by then will have been done away with and full restoration will come to head. “They shall not hurt nor destroy in all my holy mountain: for the earth shall be full of the knowledge of the LORD, as the waters cover the sea” (compare wording to Habakkuk 2:14). There is the absence of pain and tears. There is no more hardship and adversity. The things and wrong thinking that used to ravage humanity sending it on its downward spiral of sin – all of that is gone. It’s not in this future kingdom (see also Isaiah 2:4; 65:25; Hosea 2:18). “The earth shall be full of the knowledge of the LORD, as the waters cover the sea.” If you will allow me, I see the whole story of Creation, the whole history of man, and the whole of the promise that lays waiting for us in our future as being summed up in one word: GOD. Psalms remind us, “Before the mountains were brought forth, or ever thou hadst formed the earth and the world, even from everlasting to everlasting, thou art God,” (90:2; see also Exodus 15:18 and Revelation 19:6). 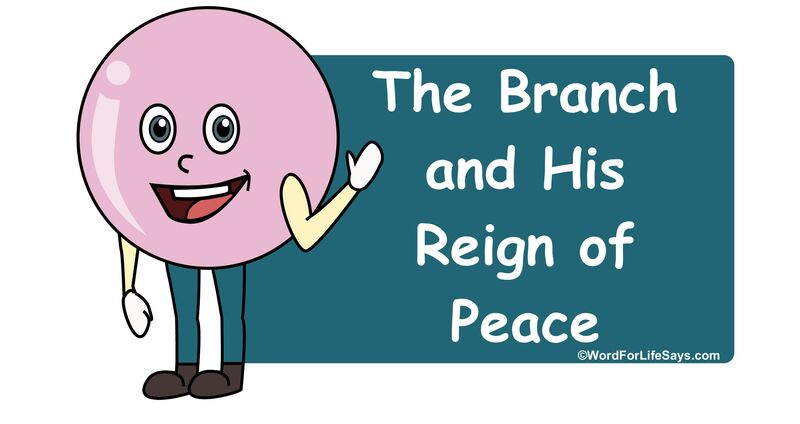 And, it is that same Sovereign rule of our holy Creator that every man and creature will respect and know of because of the very essence and knowledge of who He penetrates the world as a whole thanks to the victory gained through that righteous Branch. And, it won’t only be those of Israel who will be drawn to “his rest.” As He stands as an “ensign;” as a banner raised, even the “Gentiles” shall “seek” him. The nations will be drawn to the source of their salvation. Jesus once taught Nicodemus, “As Moses lifted up the serpent in the wilderness, even so must the Son of man be lifted up: That whosoever believeth in him should not perish, but have eternal life,” (John 3:14-15); whether they be Jew or “Gentile.” Jesus, the Branch, the “root of Jesse” was raised once on the cross when He died for the victory over our sins, and He will “stand for an ensign of the people” in that glorious day, declaring once and for all His victory and His reign of peace.